The Dalai Lama has finally seen the light on climate change. In an August report from the Dalai Lama Center for Peace and Education, we learn that His Holiness is finally concerned about climate change ... because he has just realized that it is happening in his own backyard. "Earlier this week the Dalai Lama told the Swiss press that one of his greatest concerns these days is climate change as rapidly melting glaciers in the Himalayas are posing a great threat to Tibet and the many surrounding Asian countries that rely on its rivers. "Here at the DLC, we're accustomed to hearing His Holiness talking about his concerns about the human condition and its capacity for kindness, but it's not often we hear Him discuss our planet's condition and its capacity for survival. It raises an interesting question: what is the relation, if any, between compassion and climate change?" 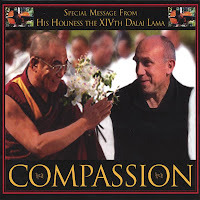 Not wanting to be unkind, I would have to ask, What ISN'T the relation between compassion and climate change? And with all due respect, I would want to add, What took you so long? We've been waiting a long time for this. Think of all the followers of the Dalai Lama around the world who haven't paid much attention to climate change because their spiritual leader wasn't paying it much heed. I am very grateful for this turnaround.